Get to work by 8. Drink water. 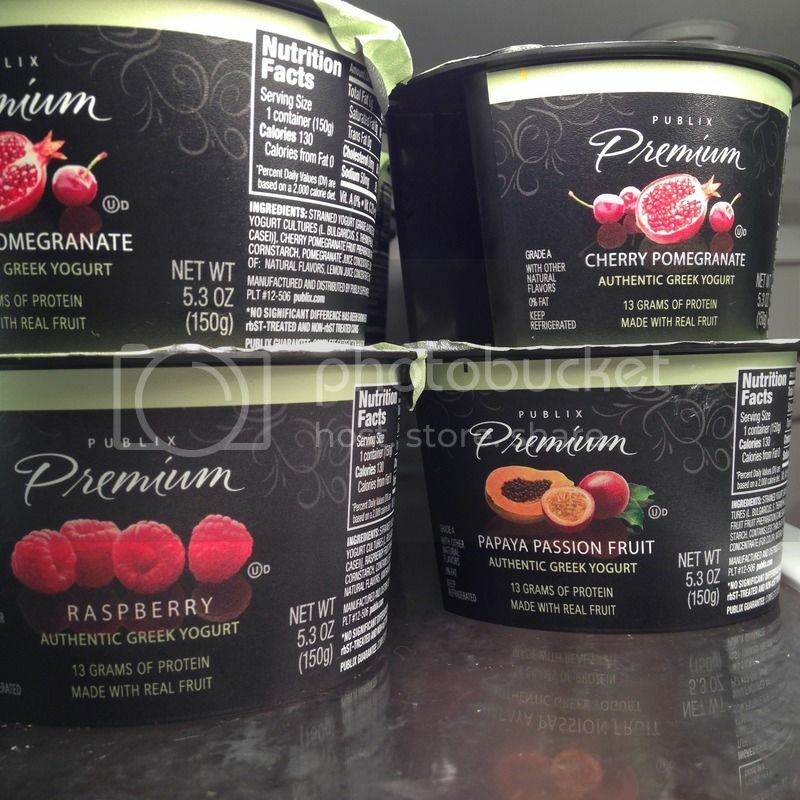 Eat a Yoplait Light yogurt (90-100 cal). Teach. Teach. Drink more water. Eat a Lean Cuisine for lunch (240-330 cal). Teach. Drink more water. Eat a snack - usually a single-serve pack of Teddy Grahams (130 cal) and a single-serve container of peanut butter (250 cal). Leave the office by 4:30. Go to the gym and exercise. Go home. Make/eat dinner. Drink more water. Blog. Sleep. On weekends, I stayed active - Saturday was generally my rest day, but I'd walk 1 mile to the grocery store (and walk home 1 mile carrying a week's worth of groceries) so there was still movement. I'd still have the light yogurts for breakfast on weekends but I'd make something for lunch, similar to my dinners - meat, veggies, maybe rice or pasta. Except for the very beginning, I didn't obsessively count calories - once I knew generally how many calories I was eating during the day, I knew that as long as dinner was reasonable, I didn't have to weigh or measure ingredients, didn't have to nitpick the exact calories. That may be one reason why I always struggle with MyFitnessPal and other trackers. They make me fixate and obsess in an unhealthy way. If my goal is 1500 calories and I log 1501, MFP shows it as red, as if going one calorie over is going to upset the entire thing. Right now, I'm keeping track of my days on a big poster board calendar I made and attached to the fridge, where I keep track of each of my January goals with a star of a different color. 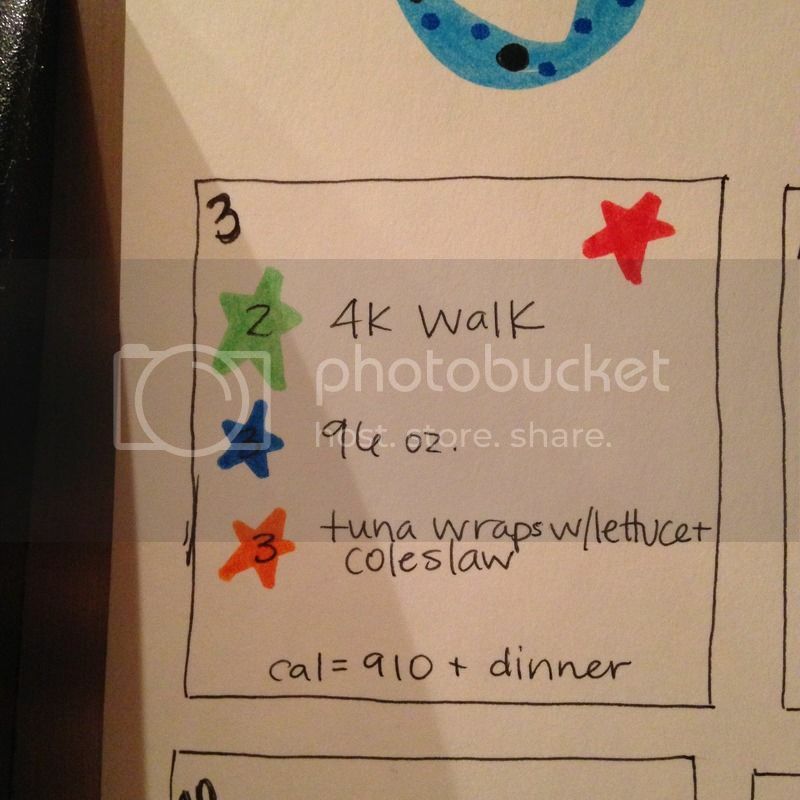 I keep track of calories during the day, but don't obsess about dinner. I try to keep my counted calories around 900-950 (a bit more than when I first lost the weight), then estimate 300-500 calories for dinner. Whatever, I eat to my hunger, but not to over-fullness. I am trying to stay as close to my original food plan as possible - but with a few modifications, to reflect what I've learned about my body and about nutrition since starting. Breakfast is yogurt, but instead of the light Yoplaits with the artificial sweeteners, I have store-brand Greek yogurt. It's 120-130 calories, and 13g of protein. Papaya passion fruit is the favorite in our house, though I also really like cherry pomegranate. Then for lunch, a Lean Cuisine. They've seriously come a long way in 5-6 years - some of the varieties available now are crazy good. I try to be mindful of the labels, but at the same time, I am not too worried about the sodium levels. First of all, because there's very low sodium in everything else I eat (and none in what I cook for myself for dinner), so it's balanced out that way. And second, because I'm never considering how much sodium is in a pizza before I binge on the entire thing. It's not perfect, but it is what works for me right now. I like having the individual portions - and not having to prep/cook lunches is nice, too. The soups are very easy to make, especially since I have an immersion blender. For the broccoli potato, I simply roasted some fingerling potatoes, steamed broccoli, threw it all in a pot with half water and half low sodium chicken broth, added some spices, and blended it up. The starch in the potatoes made it very thick and creamy, and since the potatoes weren't fried or topped with butter/sour cream, they actually aren't too bad calorie wise. 500 calories of potatoes, 100 calories of broccoli, plus broth made four servings of soup at about 160 calories each. During the day, I have a variety of snacks. Instead of having just one snack in the afternoon, I've been spreading them out during the day. 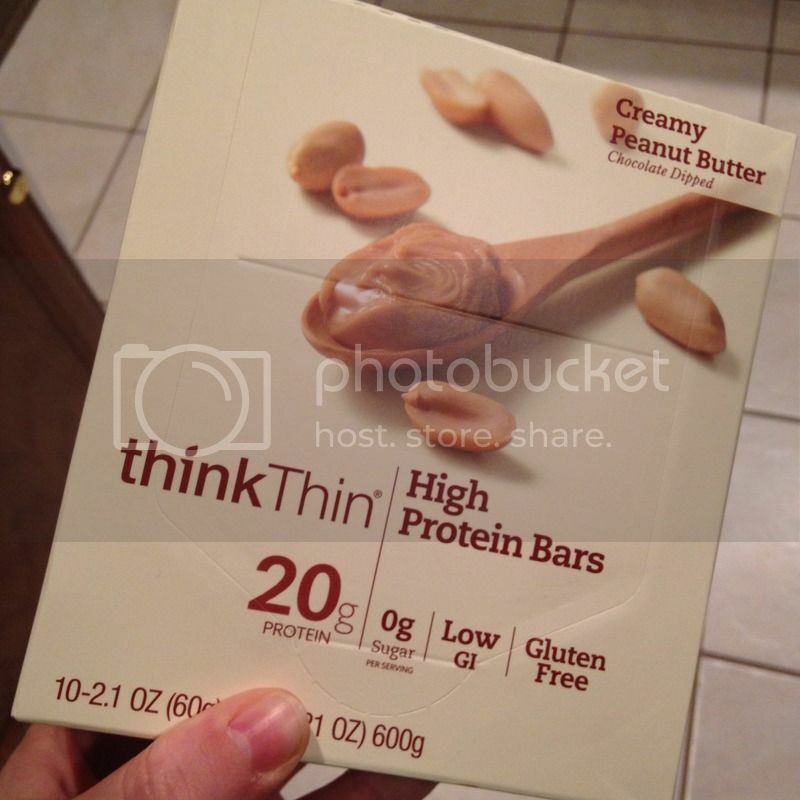 In the morning, I have a high protein snack - lately, it's been a ThinkThin bar. 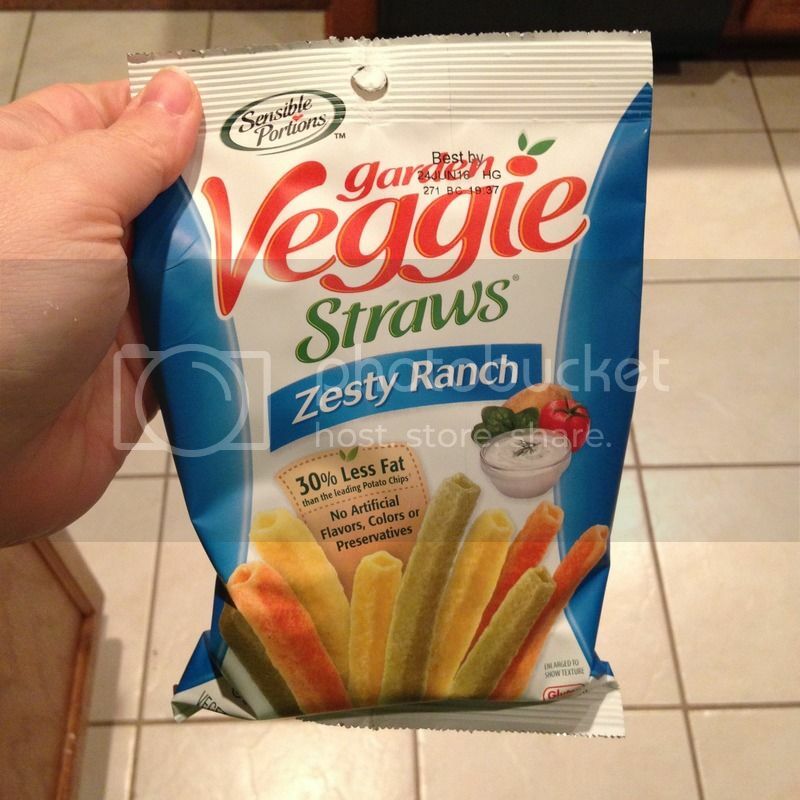 I discovered these when I was pregnant and couldn't stomach the look/smell of meat (raw or cooked, didn't matter). They're not bad, way better than Quest bars, in my opinion - not as artificially sweet. ... which, again, are cheaper to buy in a large bag and portion out myself, but right now, I am struggling with portions, so this is what works. 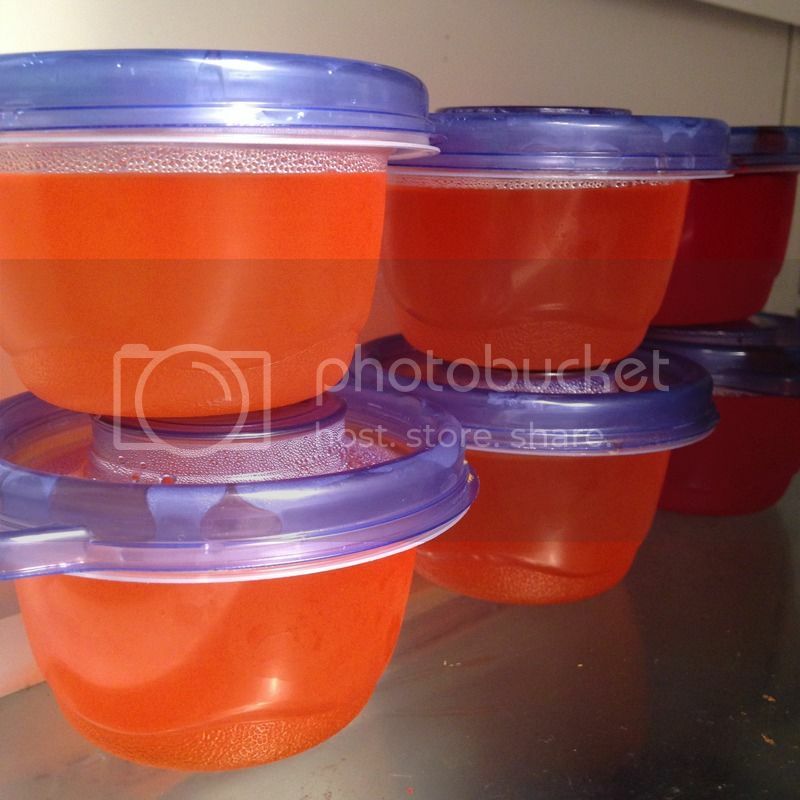 Something about having them pre-portioned keeps me in control with them. I've also been having an after-dinner snack, which also helps keep me focused. 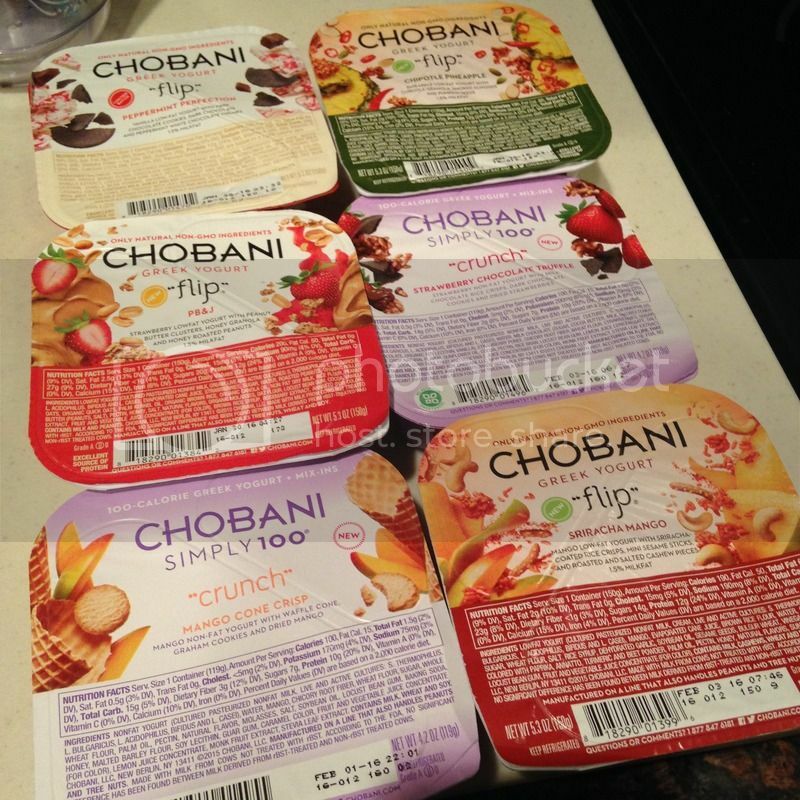 If I get hungry after dinner, I know I have allotted for another small snack - and lately, my go-to has been Chobani flips. They have some great flavors - my all-time favorite is the almond coconut chocolate one, but they just came out with a ton of new ones, and PB&J is seriously good - it tastes EXACTLY like it should. They also have a few spicy ones - chipotle pineapple and sriracha mango, which I haven't tried yet, but am super excited to. In Chicago, I lived in a Mexican neighborhood and loved the spice mix they sold in the grocery store to sprinkle on fruit. It's a delicious combination. Again, right now, it's pretty regimented, and it might not work for everyone, but it's what I'm able to stick to without feeling bored, deprived, or triggered. What about you? Do you tend to eat the same things, or are your meals more diverse? Do you meal plan before grocery shopping? Even with everything going on, I mostly maintained my weight since my husband left. Up a few, down a few, down a few more, then back up. The same four or five pounds, over and over. Then, about a month ago, I got into a bad binge cycle. The scale shot up, clothes got tight, and it was hard to get myself out of bed - physically and emotionally. I'd spend hours on the couch, just eating, crying, sleeping, watching TV. Then some days I'd go all day eating well, but binge right before bed. And I'd wake up the next morning, aching, feeling every pound holding me down, and think what is it going to take to get me to commit to recovery? It was like this in 2010, when I started this blog and started my journey to health. I was 23 and deeply depressed. Everything hurt, always. I mean, from the moment I woke up until the second I fell asleep, my legs, my back - everything was aching. I never left the house except to buy food. I felt like a prisoner in my body, and I knew that if I didn't do something soon, I'd just grow and grow - I didn't think I'd make it to age 30. Now, I'm facing 30, and my story between then and now is something I never, ever would have believed if you told me then. I want to create a better future for myself and for my son, so I'm trying my hardest to stay focused and consistent. Exercise, surprisingly enough, is the easy part of all this. Food is my forever struggle, and so I'm making sure that right now, I am being extremely basic in my exercise goals (For January, it's just a general "be active 20x") so I can concentrate more on getting the food under control. I'm sticking to a meal plan similar to the one I used way-back-when - the one that worked. It's as restrictive as I need it to be - no entire food groups are off-limits, per se, but certain foods I know to avoid unless I am certain that it will not lead to a binge. Right now, there's no cheese in the house, and snacks are bought in pre-portioned single-serve bags. Some day, these will be easier to deal with. But right now, I know my body and I know my habits and I'm doing what's right for me. Because that's it, isn't it? The best plan is the one you can stick with. The question I've been asked most often, especially after I'd lost all the weight initially, was how did you do it? tell me your plan! I got so many emotional, rock bottom emails from people saying they felt hopeless and trapped - exactly how I'd felt at the beginning - and they all wanted to know my plan. My heart ached for them - I'd been there. But what worked for me might not be ideal for someone else. For some people, it's paleo. For some, it's Weight Watchers. For others, maybe it's carb cycling or intermittent fasting. For me, it's being very regimented with my eating - I eat generally the same things every day, but rotate flavors/ingredients to keep myself from being bored. It's not a glamorous answer, and it's not the magic pill answer everyone wants. But it's honest. I tried dozens of times to lose weight until I found the routine that worked for me. And I'm still learning. It's a process without an end. While I admire the sentiment behind the saying that weight loss is "a marathon and not a sprint," I think neither one is a perfect fit. Comparing weight loss to a race implies there's a finish line - and there isn't. If there's one thing I've learning in all this, it's that I am going to need to keep conscious of this for the rest of my life. I need to recognize situations that will lead me back to unhealthy behaviors. I need to stay active and watch what I eat. This doesn't end for me. It seems daunting, but it's not as bad as it sounds. Looking back to 2010-2012: the first year, I actively lost weight. The second year, I maintained, but not always in healthy ways. Overall, though, that second year, I learned a lot about maintenance and how to find balance in my life with food, activity, and making sure that they're not my entire world. I ran a lot, I biked a lot, and I enjoyed a lot of good food in normal portions surrounded by good company. That's maintenance for me. Right now, though, I'm in that active loss phase again, so it's less fun and more restrictive at the moment. Today is Day 4, and I can't begin to tell you how much of a victory that is, after the last few weeks I had, with one binge after another. Every day I'd wake up and tell myself just get through today. Just one good day. And every night I'd go to bed feeling like a failure. To be able to say I've strung together three and a half good days so far ... it's more than I've been able to say in a long time. Three and a half well-balanced, properly nourished, adequately exercised, no gimmick, no shortcut days. I weighed myself on the 1st and I'm trying not to be so completely addicted to numbers (at least not weighing myself every day), but I feel better already. Less bloated, less irritable, easier to wake up in the morning. I wish I could remember how good it feels to do right by my body in moments when eating fast food or pizza sounds like a better idea. I think 20 out of 31 is a reasonable goal for getting back into a healthy routine. Since regaining so much weight, I've tried to jump fully back into goals I'd made at a much smaller size, and when I struggled with them, I gave up entirely. I can't run a half marathon right now. I don't think I could even do a mile. Right now, I just want to be doing something active most days, and I want to make sure I'm doing my best with the food. Especially with the semester starting again, I want a little leeway - if I made the goal "stay on plan every single day" and then I had a rough first week of classes, I'd be discouraged and probably give up entirely. Right now, 20s all around is a good goal. I can work my way up from there.